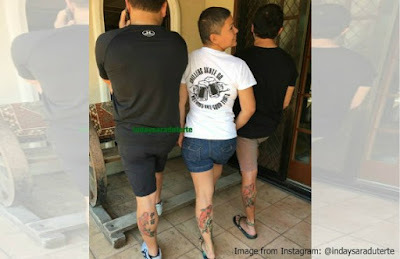 The EQualizer Post: EQ Backgrounder: The Paulo Duterte Tattoo- To Show Or Not To Show It ? EQ Backgrounder: The Paulo Duterte Tattoo- To Show Or Not To Show It ? 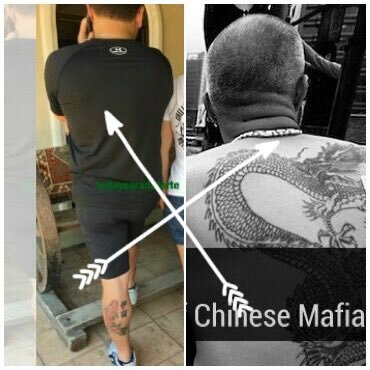 Paulo Duterte-We Dare YOU to take off your t-shirt and disprove Sen. Trillanes's allegation that you have a Chinese Triad dragon tattoo! Shy? Paulo Duterte:Don't hide behind PapaDu30. 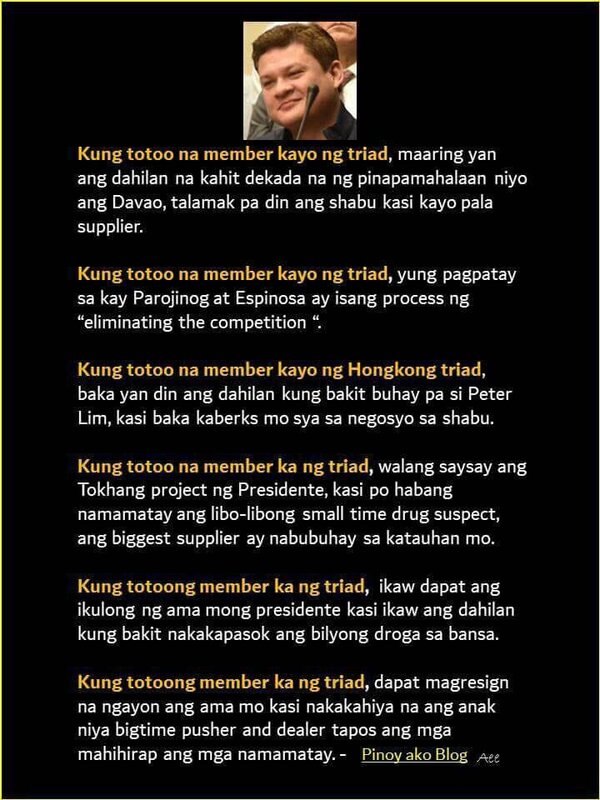 Prove that Senator Trillanes' allegation that you have a Chinese Triad tattoo at your back is false! A triad is one of many branches of Chinese transnational organized crime syndicates based in China, Hong Kong, Macau, Taiwan and also in countries with significant Chinese populations, such as the United States, Canada, Vietnam, Korea, Japan, Singapore, Philippines, Indonesia, Malaysia, Thailand, the United Kingdom, Belgium, Netherlands, France, Spain, South Africa, Australia and New Zealand. 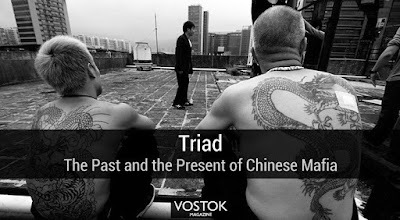 The starting point for understanding Chinese triads is to make a clear distinction between Hong Kong triad and mainland Chinese criminal organizations. 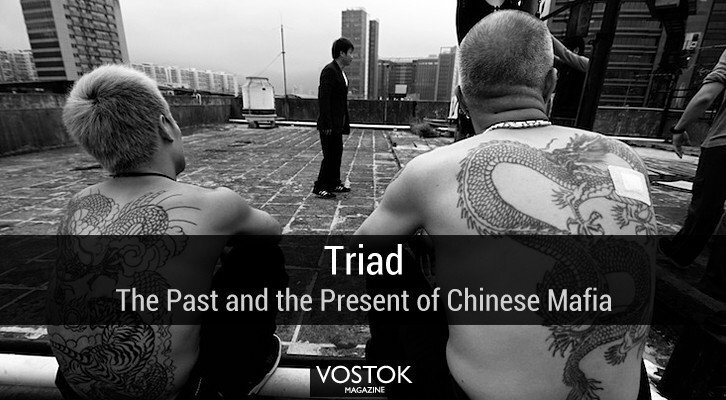 In ancient China, Triad is one of three major secret societies in mainland China.It also created branches in Macau, Hong Kong, Taiwan and Chinese communities overseas. After the establishment of the People's Republic of China, all secret societies were completely destroyed in mainland China through a series of campaigns organized by Chairman Mao. Although post-Mao China has witnessed the resurgence of organized crime groups, they are not triad societies; the proper term for these criminal organizations is "mainland Chinese criminal organizations", which consist of two major types of organization: dark forces (loosely organized groups) and black societies (more mature criminal organizations). Two features that distinguish a black society from a dark force are (1) the ability of achieving illegal control over local markets, and the obtainment of police protection. In short, Hong Kong triad refers to traditional criminal organizations operating in or originating from Hong Kong, Macau, Taiwan and southeast Asian countries (areas), while organized crime groups in mainland China are better called "mainland Chinese criminal groups". Chu's Triads as business (2001) presents a thorough examination of the rise of Hong Kong triad and the role of triad societies in legal, illegal and international markets. Wang's The Chinese Mafia (2017)studies the origin of Chinese secret societies in ancient China, explores the rise of organized crime in post-Mao China, and investigates the ways in which local gangs offer quasi law enforcement and private protection to local governments, corporations and individuals. The Chinese Mafia also explores how local gangs form mutually beneficial networks with police officers and how the formation of the political-criminal nexus enables local gangs to control illegal markets and sell protection to legitimate entities. 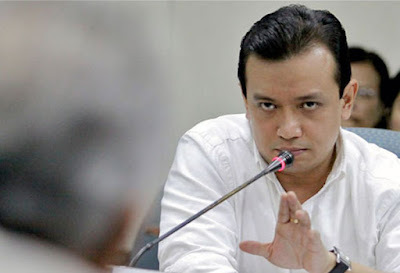 Metro Manila (CNN Philippines, September 7) — Sen. Antonio Trillanes IV accused the eldest son of President Rodrigo Duterte of being a member of an organized crime syndicate. 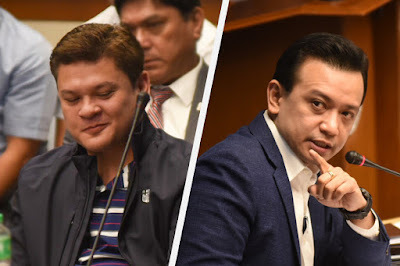 Trillanes, a fierce critic of the Duterte family, said in the Senate hearing Wednesday that according to intelligence given to him by a foreign country, Davao City Vice Mayor Paolo Duterte has the tattoo of a Chinese drug triad group. "Ang proof ng kanyang membership ay yung tattoo sa likod," Trillanes said. "Yung tattoo mismo kasi meron siyang sacred digits." "'Yan ang mage-explain ng lahat ng ito at mayroong competition among syndicates dahil that's the physical evidence of his membership sa triad," he added. "This intelligence information was handed down to me from a foreign country and na-validate naman, in-admit naman ni Mr. Paolo Duterte." Although Duterte confirmed he had a tattoo on his back, he refused to show it. "Yung tattoo mo sa likod [That tattoo on your back], I imagine, it's a colored and dragon-like figure tattoo, am I correct?" Trillanes asked Duterte. "I invoke my right to privacy," replied the vice mayor. Triads use numeric codes to distinguish between ranks and positions within the gang; the numbers are inspired by Chinese numerology based on the I Ching. "489" refers to the "Mountain" or "Dragon" Master (or 'Dragon Head'), while 438 is used for the "Deputy Mountain Master", a "432" indicates "Grass Slipper" rank and the Mountain Master's proxy, "Incense Master", who oversees inductions into the Triad, and "Vanguard", who assists the Incense Master. "426" refers to a "military commander", also known as a "Red Pole", overseeing defensive and offensive operations, while "49" denotes the position of "soldier" or rank-and-file member. The "White Paper Fan" (415) provides financial and business advice, and the "Straw Sandal" (432) functions as a liaison between different units. "25" refers to an undercover law enforcement agent or spy from another triad, and has become popularly used in Hong Kong as a slang for "snitch", i.e. informant. "Blue Lanterns" are uninitiated members, equivalent to Mafia associates and, as such, do not have a number designation. Davao City Vice Mayor Paolo Duterte refused to have the tattoo on his back be photographed after Senator Antonio Trillanes IV said this could be the proof of his link with an international triad. Citing intelligence reports, Trillanes said the tattoo bears “sacred digits” that could be decoded by the United States’ Drug Enforcement Agency. “Kung wala ‘yang tattoo na ‘yan, kung wala kang tinatago, you shouldn’t be afraid,” Trillanes repeatedly told Duterte. “So maliwanag talagang ayaw mo kasi ‘yun ang proof, nandyan sa likod mo at nandoon ‘yung digits—sacred digits at kaya ayaw mo, kapag binigay sa DEA madedecode saan ka kasama,” Trillanes said. MANILA (UPDATE) - Davao City Vice Mayor Paolo Duterte's legal counsel on Thursday questioned Senator Antonio Trillanes IV's motives for asking the President's son to show his back tattoo at a public hearing. "Why does he want to see my client's tattoo? Is he gay? If he's gay, I may have allowed him to see it," lawyer Rainier Madrid told reporters after his client attended the Senate Blue Ribbon Committee hearing on the entry of a P6.4-billion shabu shipment that has exposed alleged corruption at the Bureau of Customs (BOC). Madrid said he advised Duterte to decline Trillanes' request as the body mark was not related to the subject of the nearly 4-hour hearing. 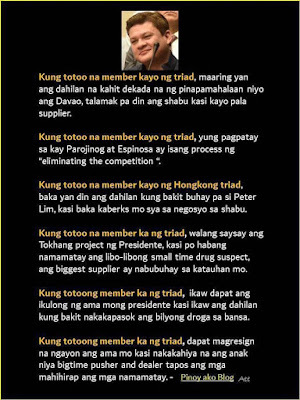 Trillanes had asked Duterte to show his back tattoo as this would purportedly prove that he is part of the triad, an international crime syndicate. "My client refuses to be an "uto-uto" (gullible)... I will not allow my client to be humiliated under such a silly circumstance," Madrid said. "We do not want to dignify Trillanes' accusations and fishing expedition. The issue discussed in the committee is not [the] existence of the tattoo," he added. Madrid said he neither saw nor confirmed from the Vice Mayor if the tattoo on his back was a "colored dragon" as Trillanes had alleged. "A tattoo is a very private matter. I won't ask my client to show it to me unless I'm gay and I want to see his body," he said.